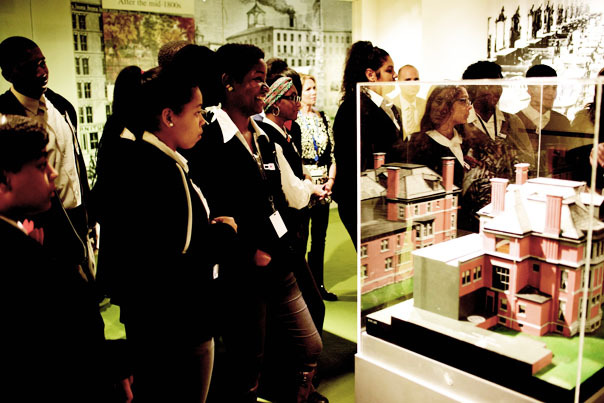 In anticipation of this year’s Winter Antiques Show loan exhibition, Ahead of the Curve: The Newark Museum 1909–2015, students from East Side House Settlement—the Winter Antiques Show’s beneficiary since the show started in 1954—toured the museum. Students at the Newark Museum’s Ballantine House. Photo by Jay Savulich. The Winter Antiques show is known for its sophisticated lending exhibitions, festive opening-night party, large and varied roster of dealers, and rigorous vetting process, but sixty-one years ago it began modestly as a small booth in another show. A board member from the East Side House Settlement, a supplementary education resource center in Yorkville on the Upper East Side, had inherited several trunks of Parisian couture and, along with some of her fellow board members, took a booth at the 1954 National Antiques Show at Madison Square Garden, where they raised $1,700 for East Side House. Just one year later the board secured the Seventh Regiment Armory on Park Avenue for a January weekend, and the Winter Antiques Show as we know it was born. One could apply this “exceptional” rating to many of the students that ESHS serves. There’s Linda Laftimi, a sophomore at the School for Tourism and Hospitality, who has perfect attendance and makes A’s, or her classmate Kareem Davis who reads the entrance requirements for the University at Albany (SUNY) to stay motivated in school. Kareem and Linda were among the ESHS students invited to visit the Newark Museum in October to preview the kinds of objects they might see in Ahead of the Curve at the Winter Antiques Show, where they’ll tour and act as greeters. Students at the Ballantine House. Photo by Jay Savulich. Ballard adds that besides their Winter Antiques Show connection, there’s another strong bond between the Newark Museum and the East Side House Settlement. “Both are driven by missions committed to educating their constituencies,” she says. And just as the Newark Museum provides a place for art to flourish, so the East Side House provides a place for people to do so.